In an idyllic rural neighbourhood, Ellamore Bed & Breakfast offers you a peaceful country residence where you can rest and relax during your visit to Ireland. Situated convenient to Cork Airport and Ringaskiddy Ferryort at Ellamore B&B you have an ideal base for discovering the magic of Cork and Kerry. Ellamore is a modern, spacious and comfortable family home where a warm Irish welcome is guaranteed. 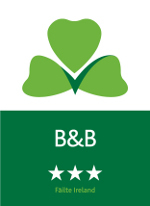 Ellamore bed & breakfast is fully approved by Bord Failte, the Irish Tourist Board, and is a member of the B&B Ireland Assocaition. Beautiful home in a nice quiet setting, Kathleen was wonderful and helpful with suggestions of where to eat and visit. Ellamore was a such a beautiful B&B on a quiet country road. The pristine accommodations had everything you could want or need. Our hostess Kathleen was wonderful with suggestions for places to eat and what to see in the area. I would definitely stay there again. This is the best of 4 B&B we have stayed during this trip. The hostess was very welcoming. Very good breakfast, large and comfortable room. After the first night we have found showering before 7 am will definitely have hot water. If we were to stay at this place in future we will not follow the GPS but the direction given by the host. The GPS showed us a long and very narrow road. Spacious and comfortable room with a wonderful view of the landscape. Very friendly owners. Beautiful garden. On route, we missed a turn and ended up being directed by the GPS via endless narrow roads. We finally did arrive. The house and room were large, new and very nice. I met the hostess for all of 5 minutes in the morning so unable to say much more.